She also asked about how to create a more “open feel”, and mentioned that she only uses the upper cabinets on the right side of the room to store things she doesn’t really need to get to. I think we all know what needs to happen to those cabinets. My inspiration pics are all pretty much the same, but I did pop a few different rugs in so that she could see what different patterns, colors and textures looked like down there. 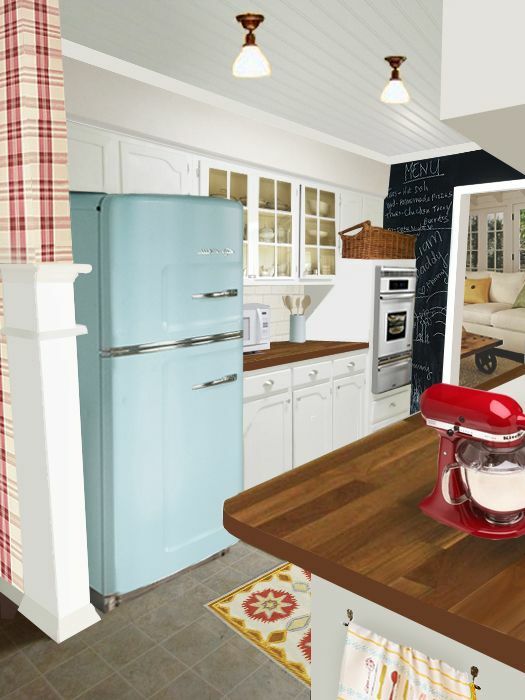 My overall goal was to accentuate the positives, and to give Beverly some ideas for the challenges, in her small, window-less, galley kitchen. 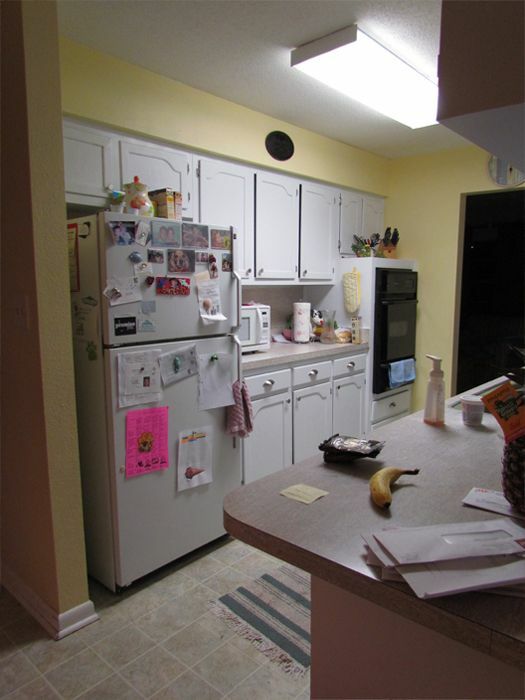 Positive: Three cabinets above the counter to the right of the fridge. Accentuate them with: Glass-fronted doors. You can buy new ones at Ikea, or follow Susie’s lead and make your own. It’ll help open up the space a little more visually, and since there’s not a lot of wall space to hang frames or accessories on, pretty dishes can act as art instead! Positive: The wall at the end of the room. Accentuate it with: Something that’ll capture your attention and make a bold design statement! Not into the high contrast of the black chalkboard wall? Make your own custom color chalkboard paint by following these steps instead. Not into the chalkboard wall period? It’s all good. Maybe you’d rather paint it a cheerful color, stencil it like Ronda did, or wallpaper that wall instead of the wall I showed papered in my drawings. No matter what- just have fun with it! Challenge: There’s only one place to put a single-doored fridge. Solution: Make it a snappy one! I chose a cool, aqua blue model from Big Chill to add a little whimsy and color to the space. Challenge: One, off-center, fluorescent light. Solution: Two, schoolhouse-style lights, spread apart by a few feet will wash the entire space with light. Yay! 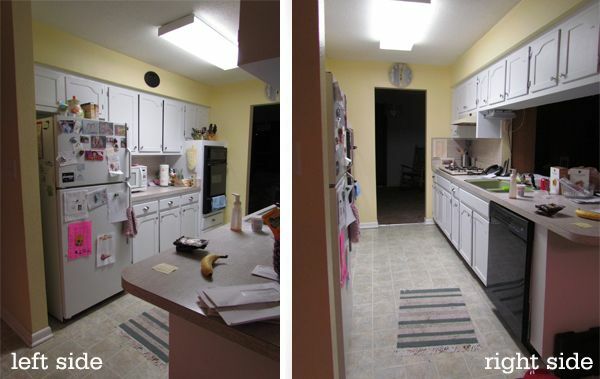 Under cabinet lighting will also help brighten things up, so I’d suggest looking into that option as well. Sarah showed how to do-it-yourself here. Challenge: Short, upper cabinets. Solution: Paint the drywall that’s covering the soffit above them the same color as the upper cabinets to create the illusion of taller cabinets. Seeing white all the way up to the ceiling will make it feel like the cabinets are a foot taller than they really are! Thank you for the opportunity Beverly! And thank you to everyone who submitted photos so far. I look forward to randomly selecting another one soon! Send an email to PickMyPresto [at] aol [dot] com titled, “PICK MY PRESTO”. Make sure to include your name, your blog name (if you have one) your design likes & dislikes, and one photo of the space in question. (No links please.) It should be clear, and measure at least 400 pixels high x 600 pixels wide. (In other words: 4″x6″) Make sure it’s a photo you’re comfortable with me showing and writing about on our blog. 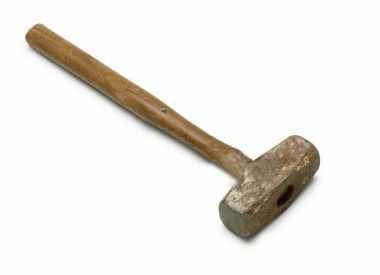 Then, whenever I’m feelin’ the urge, I’ll randomly select someone’s email and have a little fun creating some traditional or cottage style presto chango inspiration. Oh, and since I love surprises, I probably won’t email you to let you know I’ve “picked your presto” unless I have a specific question for ya about your space. Wow! Love this kitchen and love the bead board on the ceiling! The colors are absolutely lovely and subtle enough to allow the fantastic details like the fridge to stand out. Thanks for sharing . . . loving this Presto Chango series! Very inspiring! Incredible transformation!! You rock, Layla! that’s amazing~!!!! You never cease to amaze me! Wow, Layla! That is amazing!! I love each of those changes! The colors are beautiful, and so much fun! We just got finished doing a lot of work in our kitchen. I am so happy with all the changes. Knocking out a wall and removing a bunch of the contractor cabinets and installing open shelves helped lighten up the kitchen A LOT. Here is a link if you want to see: http://the7daggetts.blogspot.com/2011/02/kitchen-update.html. Beth @ Beach Cottage in the Desert. Love this so much!! I want that rug in the second picture – may I ask where it came from? Thanks!! So glad I found your blog…I was in real need of some inspiration and you have surely given it to me! You are so incredibly talented!! I really need to send in a picture of our living room. I live in a box….blah! AMEN, Sista! The first order of business, too! Great transformation. Great ideas and what a fun kitchen it can be. The chalkboard is such a fun thing in a kitchen and I love the frig. WOW!!!! This is awesome. The color scheme is one of my favorites. You outdid yourself on this one. It’s beautiful! Fantastical! As ALWAYS, Layla. Are you absolutely, positively, without a doubt, really, really, really sure that you don’t want to continue your virtual consultations? Sigh. You can see I am wishing you would 🙂 but, if you can’t, these presto chango-s are inspirational awesomeness! Love the Presto!!! That fridge is so fun! Love love love those ideas!!!!!! I have never commented before, but I just had to say I love how your mind works! This is just an amazing transformation. Thank you for sharing this. OMG! Layla, I must have missed this post. I have wanted to buy one of your virtual consultations for a long time now but I saw that you were not doing them anymore. I’m so excited that you are doing this series! Pick me, pick me. I have so many rooms I need help with. I will send you a picture. Have to figure out which room first. lol Can you submit more than one room? Squeal!!!! Omy my gosh – I absolutely LOVE it and I can’t wait to get started! I promise I’ll send updated pics so that everyone can see want I do (of course, $ is tight so it will be a few changes at first). Layla, thank you so much for giving me inspiration and a vision. You are truly blessed with your talents. p.s. should the soffit stay when I take the right side cabinets down? Jeepers, Layla. . . this is amazing! The ideas, the photos, the inspiration pics, everything! Thank you so much for including the still photos at the end–sometimes it’s hard to make the “magic” work with my cursor, so it was nice to be able to see the still photos. I read all of these comments and I can’t believe it takes 6 hours to do a presto change! Wow! Now I feel really priviliged and blessed. Thank you again, Layla. p.s. Love you last name!! I am going to snap a pic of my 25 foot long living room that is only half furnished and then cross my fingers and toes that you will pick mine and fix it for me because I cannot figure out what to do with it! Get rid of the soffets! It’s a great area to display wonderful treasures (unless you have a cat like me)!!!! I love it. Now I need to get a house so yu can work your magic on it! These are so fun! I love that you are doing this! These presto chango’s are some of my favorite things about your blog! You rock. I love your website. I love your kitchen design. And, I LOVE your house! I am in the beginning stages of completely redoing my home after the death of my spouse 2 1/2 years ago. I am now ready to just start fresh with things I love. Your blog inspires me. What a gorgeous transformation! I love your site, and now I am thinking I should submit a photo myself! You are so inspiring! Love the presto changes! It is amazing that all three presto changes are the same with only the rug changes, each one brings out a different contrasting color pop in the picture! Homegoods here has had that fridge in its store for the past month, I might caress it every time I am in it **wink wink**. It is to die for with its curves, chrome and beautiful color. Thanks for making me love it even more and showing how it can work in a ktichen without turning the kitchen into a total throwback theme type kitchen! Wish I could incorporate more style like this into our military housing! 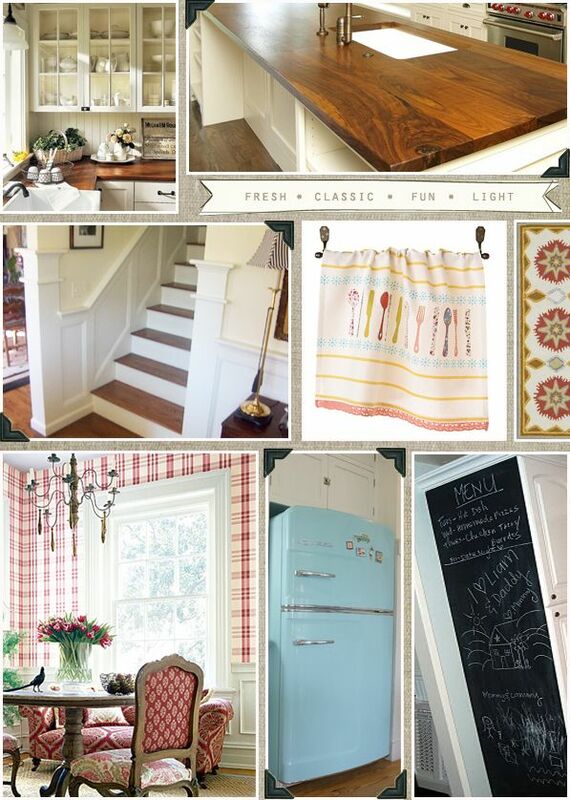 I have a similar kitchen and would love to do beadboard on my ceiling, but my kitchen is 12.5 feet by 12.5 feet. Which means if I used the boards, I’d have seams everywhere. Any suggestions on how to avoid that? We’re going to use it on the ceilings here at TLC too. We plan to cover the seams with long, thin strips of wood. ~Paint the white PB table turquoise or leave white? ~Window treatments- plain creamy neutrals or fun print? How to dress that double window? Cafe curtains or long drapes? I love a retro feel but don’t want to be SUPER over the top. I love the balance you created in this presto. In any case, I LOVE LOVE LOVE what you did here and pretty much everything on your blog. You and your husband are such a talented team! Gotta say, I positively covet (I know, bad to do) the AQUA and pop of red in the kitchen! So I will just say I am enamored of your presto-change-OH Layla. Your ideas are great! Thanks for sharing! that is a pretty amazing outcome. I love the way computer imaging can be used to visualize the results. AND really like the new colors. I am so in LOOOOVVVVVEEEEEEEE! Super great job! Love This!!! Love the beadboard ceiling. Love the new lights. Love the wood counters and especially love the fun refrigerator. You are so talented and have such an incredible eye for putting together such great designs!!! I love this feature of your blog and would love to try to do this myself with several of the rooms in my home. I have a basic working knowledge of Photoshop Elements and was wondering if you would consider posting a brief tutorial on how to “presto” your own home using Photoshop!?!? I haven’t done anything like this before and have been trying to google a tutorial to figure it out myself, but have been unsuccessful. Just wanted to see if this was something you might consider someday 🙂 Thanks again!!! I never would have thought of the things you came up with but you give me hope that I won’t have to live with an ugly kitchen unless I take out a 2nd mortgage.